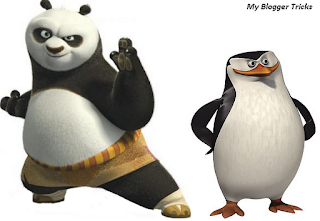 Google Penguin and Google Panda Penalty - What's That? As we all know, Google is a pioneer, and the world leader in internet search. It owns around 2/3rd (66%) of the shares in the industry at the time of this writing, making it bigger than any other internet company. It has been around for quite some time now, and has been updating its search functionality regularly. Since the past few years though, we have seen some radical changes in its search model. For example, it was only last year that the dreaded Panda update was unleashed onto the world! And these days, everyone is talking about the new Penguin update that rolled out just a few days back. Head of Google's web-spam team, Matt Cutts tweeted a picture of a stuffed penguin along with a stuffed panda. How cute :). Or is it? Some people would agree. But many will say quite the contrary. These animals are supposed to give out a friendly image about the updates. They are monsters in disguise though! Many websites have been punished and penalized by these two. So what actually are they all about? And how do they effect websites? If this is about any one thing, it's about Quality Content vs Search Engine Optimization (SEO). The concept of SEO has evolved ever since search engines like Google have come along. SEO is good. It allows you to take your website ranking to a higher level. But that's precisely where the problem lies. You see, it provides a shortcut where you can skip writing quality content, and still be able to take the low quality content to a high ranking. In late 90s and early 2000s, when Google was still newborn, some webmasters started doing just that. They would spare themselves the trouble of writing good quality content, and would learn SEO tricks instead, which brought their poor quality content to the top. Through he years, search engine optimizers kept at it. Google has been constantly improving its search module, but these people learned to duck and dodge everything Google had to throw at them. Fundamentally, this practice defeats the basic goal of Google, which is to provide good quality content to readers, instead of bogus websites that spam the web and gain the high ground in SERPs (Search Engine Results Pages). Hence, the need for an advanced screening mechanism which would let quality through but not spam content. Although Google has been implementing such a filter throughout the past few years, it only rolls out major algorithm updates once a year. Google Panda was just such an update last year. And may I say, it was the deadliest update yet. The major update for this year is the Google Penguin update, and it looks relatively less harmful than Panda, although it still has effected a lot of websites. So basically, these updates are aimed at promoting quality and filtering out spam. 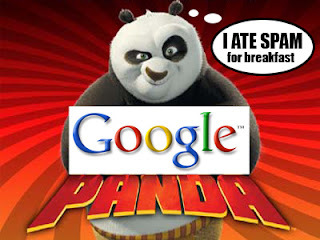 Google unleashed the Panda on Feb 24 2011. And immediately, it made its mark and hit so many blogs and websites that the entire ranking structure was shaken, with new websites coming at the top while some old established websites dipping down. According to Google, it was aimed at filtering "thin or low quality content". Since its launch, Google have made changes to it 13 times as of 20th April 2012. And a total of 12% websites have been effected by this update. In the next few days, we’re launching an important algorithm change targeted at web spam. The change will decrease rankings for sites that we believe are violating Google’s existing quality guidelines. We’ve always targeted web spam in our rankings, and this algorithm represents another improvement in our efforts to reduce webspam and promote high quality content. While we can’t divulge specific signals because we don’t want to give people a way to game our search results and worsen the experience for users, our advice for webmasters is to focus on creating high quality sites that create a good user experience and employ white hat SEO methods instead of engaging in aggressive webspam tactics. Once again, these updates are aimed at punishing spam websites, although there could be a lot more reasons for the updates to hit your site. Sites that are hit have seen a demotion in their Google PageRank, and their traffic has dipped, while sites that have benefited from this update have seen a soar in their traffic. The saying "One man's gain is another man's loss" never seemed more appropriate. Why have you been effected? There can be many reasons why you got hit. But the exact factors are known only to Google insiders. Google doesn't disclose this information, because if they do, search engine optimizers would grab on to those points and cheat Google once again. So Google does not give out the precise details, thank you very much. Here are, however, some probable causes as to why you took a hit. Over optimization - This is very important. People who don't have quality content over optimize their websites. So you should do what is necessary, and no more! well written, keep it up. Tell me please .. how bounce rate effect your blog's SEO. well written Qasim, I would like to know ,which is appropriate size for page load ,I have seen that you page is of more than 2 MB and mine is just 1MB but it seems your page load faster . whether page size is important or page load time is important? if both then which is most? Nice article. 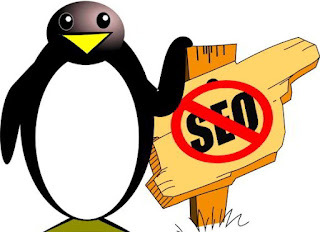 liked analysis on what could be the reasons for google penguin to affect you; but google does it with a bot or crawler and it advises to check the website content on text browser to get the picture of how they will be interpreted by the google crawler. So how its able to think about "lack of user experience" remains the mystery though! what you think? How to upload custom template in New Blogger UI ?? My Page rank drop from 3 to 2 very sad may be these were the reasons! 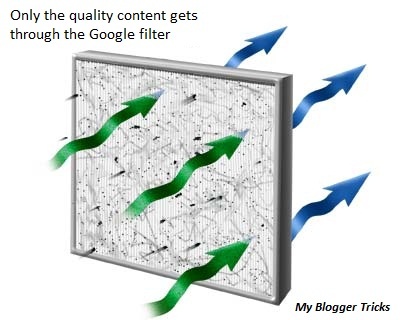 Remember that a blog's trafic depends largely on its content, rest everything else has secondary priority. So if your Average Post word limit is above 700 then you can expect a consistent flow of traffic and expect to be safe from all such Google penalities. The aim of these penalties is only to let bloggers realize that they must offer High quality, unique and first heard Rich TEXT to Google. Text should be given more preference than graphics or other media. robots can only see what you write, they can't read images and videos unless tagged and captionized respectively. hey.thanks for the tips about google penguin and google panda.it really helps.i never know it may affect a site that bad. any new errors on it . Thanking a lot for this tip. I think most people are making duplicate contents and they are hopping much traffic.